It’s been nearly a week since the last blog post and I have taken the opportunity to hide from the rain again to write another post and bring you up to date with our discoveries. If you have been following our Twitter feed or Facebook page you will have seen that it is quite prehistory-heavy this week! 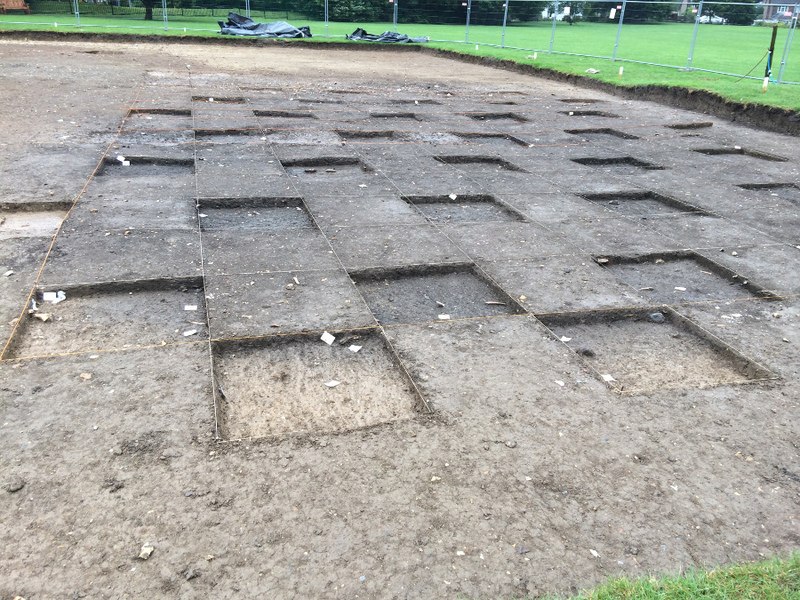 Not only have we started to excavate into the barrow ditch, but the five cremations discovered in the centre of the barrow in April have at last been lifted. clear, you should be able to see the darker charcoal-like patch in the middle of the square that Niall and Andrew are cutting in the photo above. When cleaned up, small fragments of white and black burnt bone and the edges of very degraded pottery are visible, indicating that a cremation has been placed in a pot. The block-lifting takes some time and they are extremely heavy – as this next photo testifies! Carefully wrapped up, it needs several students and a wheelbarrow to transport it to the Finds Hut. 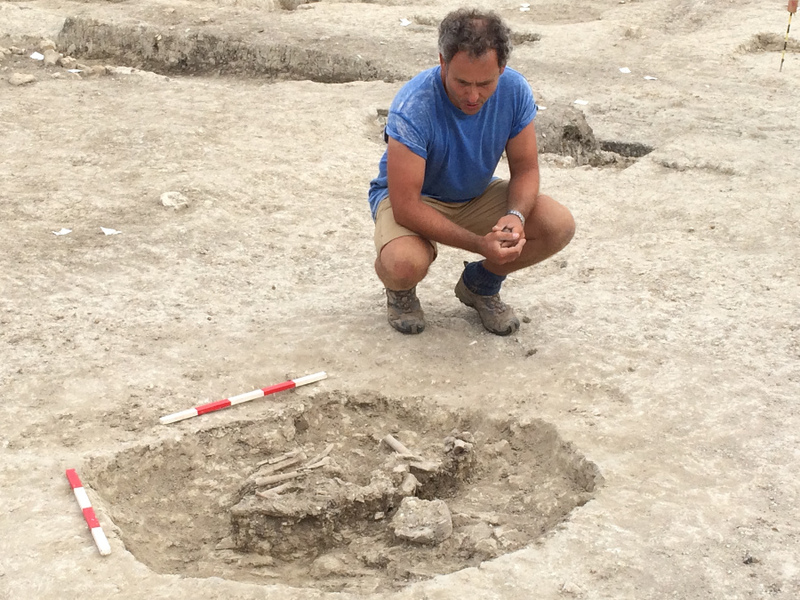 While we have lifted five cremations and expect it likely that we might find more in the centre of the ring ditch, this week revealed more evidence that Tayne Field was a focus of mortuary activity in prehistory. One of our students, Tom, is digging at Lyminge on his very first excavation. He was tasked with excavating what appeared to be a post hole in Trench 2. Almost immediately he began to see that the cut of the possible post hole was larger than expected, and that there were bones within the deposit. It was quickly established that these were not the usual animal bone waste found across the settlement at Lyminge, but clearly human remains. 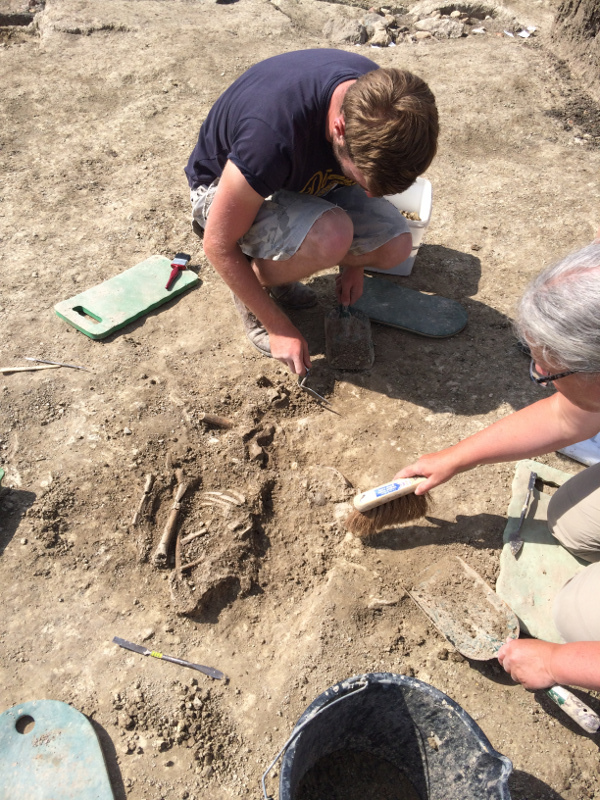 As you can see from the photo below, we are dealing with a crounched inhumation with the individual lying on their side, knees curled towards their chest. Unfortunately the skull and some lower long bones are completely missing, most likely because the grave is truncated by later ploughing. The shape of the skull is such that it usually lies at the highest point in a grave, and so is often lost in this way. ‘Beaker people’ or ‘Beaker culture’ after the pots within the burials. Such culture dates from c. 2500 BC in Britain, up to around 1700 BC. A very famous and well furnished example is the Beaker Burial at Stonehenge, the ‘Amesbury Archer‘. 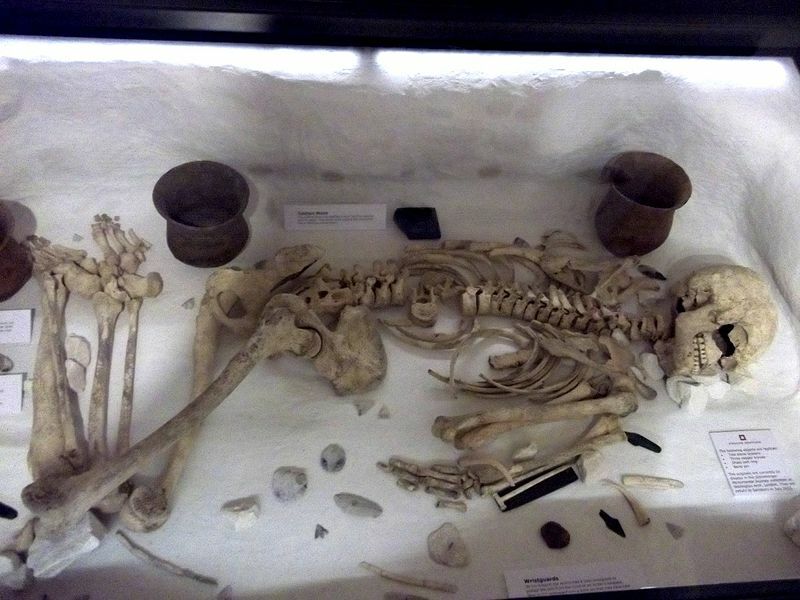 It is unusual to find richly furnished Beaker Burials in Kent, and the burial at Lyminge has been disturbed through later farming, however we are lucky to have found one small bone object on the skeleton that was probably worn by the individual buried. In the image below is a small bone toggle. Bone fastenings or toggles are known, but this one is a very interesting shape and potentially fastened a strap or perhaps a belt. We must emphasise that we are being careful to treat all human remains with respect, and we are covering the grave until it is recorded and the remains lifted. Our licence to exhume human burials for research stipulates how long we keep them and how we treat them, and the same goes for the cremations. Of course, the main reason we are in Lyminge is to explore the Anglo-Saxon settlement! We certainly haven’t neglected the Anglo-Saxons this week, even with the excitement surrounding our prehistoric archaeology on site. 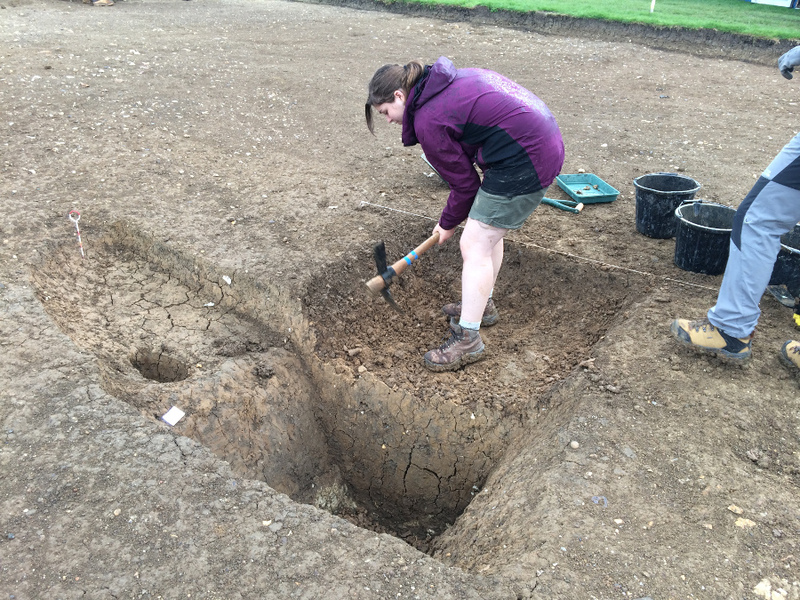 Much progress has been made on the area known as the ‘blob’ or our possible surface midden just south-east of the barrow. 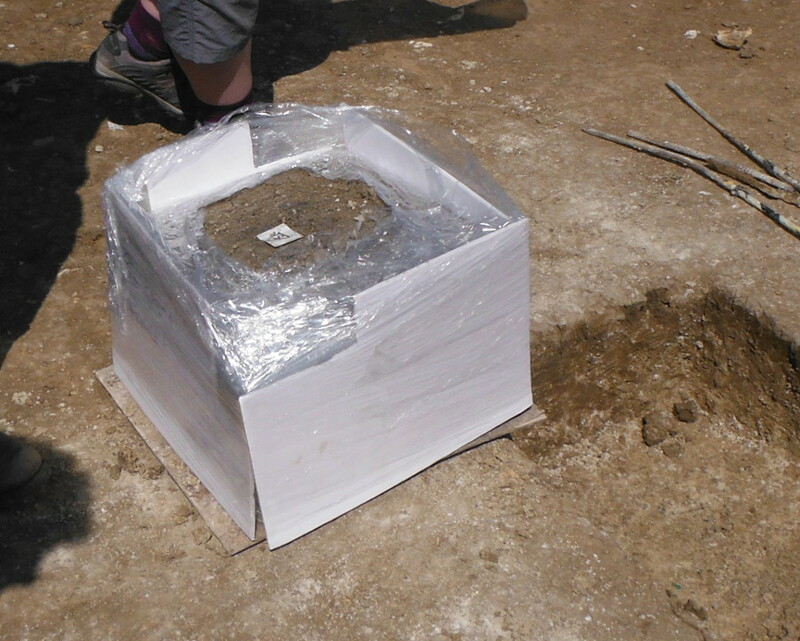 We have at last identified some clear edges to the size of this feature, as you can see in the image below. 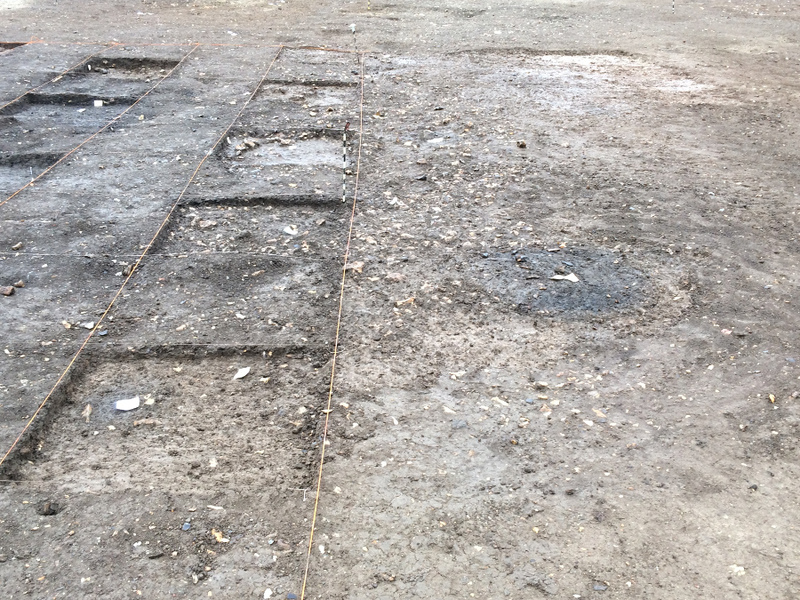 Taking this large area down in a grid pattern, 100mm at a time, allows us to keep a detailed record of where all the finds are coming from, which will be particularly important if we begin to see different features beneath this large spread of material. 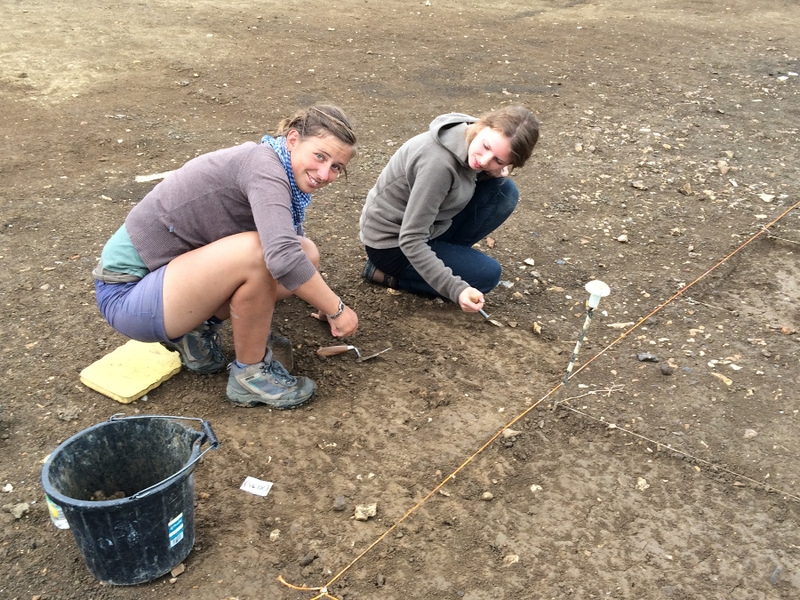 Already we have found a particularly interesting area at the edge of the possible midden. 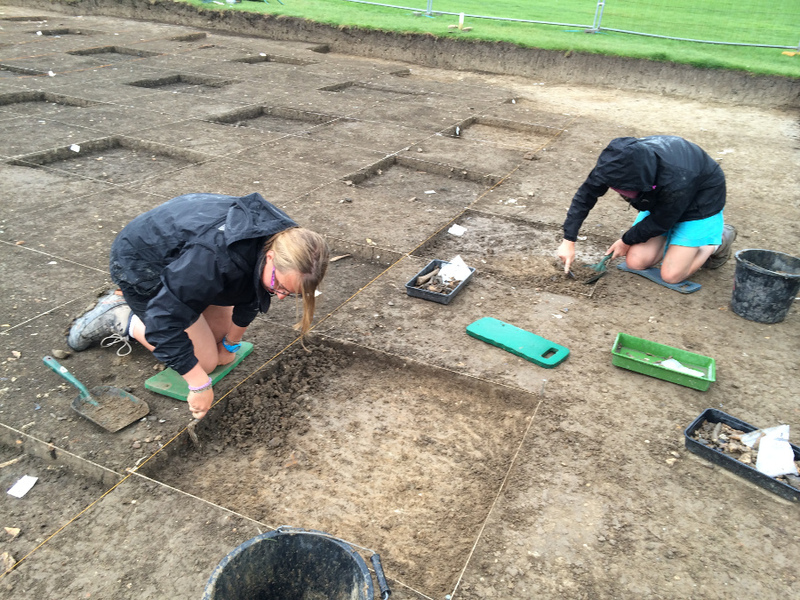 In taking down some of the 1 x 1m squares, we began to see a great deal of flint. Cleaning this back carefully has show us that the flint appears to have been laid down for a specific purpose, with some very large pieces selected. It appears to form a metalled surface that might have formed part of a yard area or perhaps an area for a specific activvity. 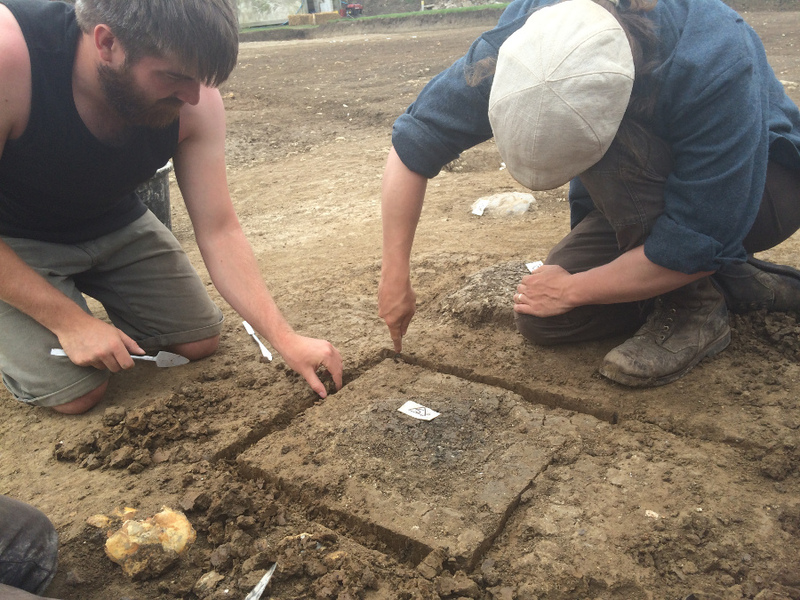 Because it is on the edge of the midden spread, overlain by some of the midden material, it is quite possible that it relates to pre-existing features beneath the rubbish, or that perhaps it is contemporary and later ploughing has pulled the midden material over the flint metalling. 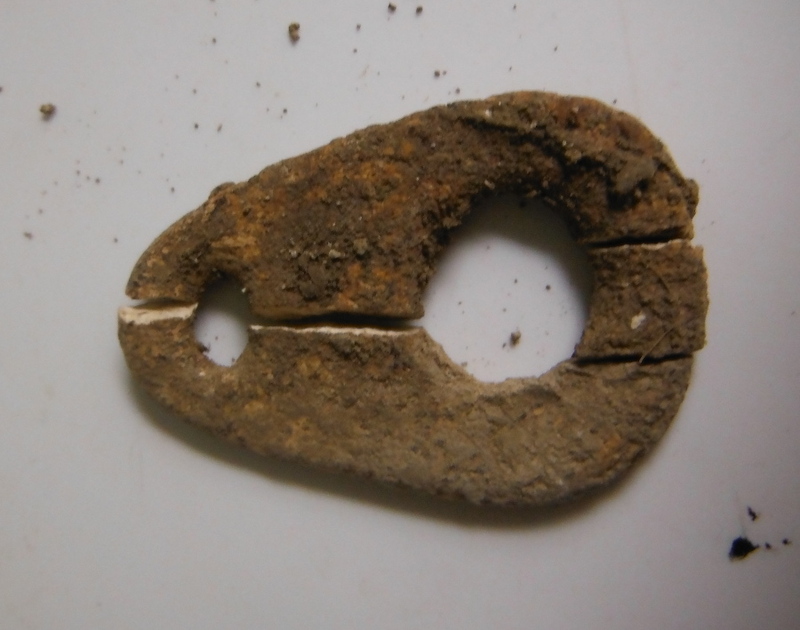 Certainly there are Anglo-Saxon features cut through the metalling – you can see one of these in the image below, where a large dark pit containing datable Anglo-Saxon material has been cut right through the flinty area (to the right of the 1 x 1m squares). Excavating inside the ‘blob’ has also been extremely productive. In the last post I showed you a beautiful brooch that came up quite early on, and since then one of the most frequent finds has been an amazing quantity of glass fragments. 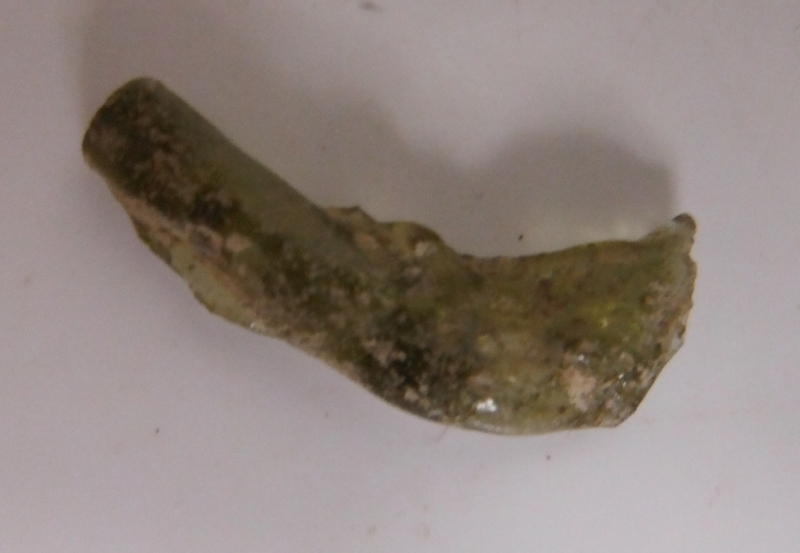 Evidence for glass manufacture (c. 3cm) found in a pit in Trench 2. 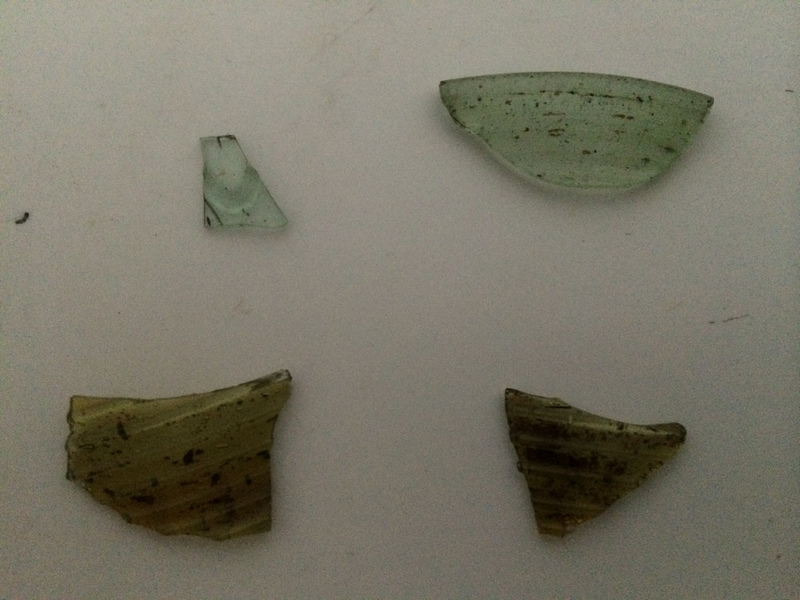 Glass is not a common find on settlements, although a great many complete vessels have been found in Saxon graves in Kent. What is really interesting is that we have a very large assemblage of glass from Lyminge now, and so far we have counted over forty fragments from this season alone, many of them from this midden area. 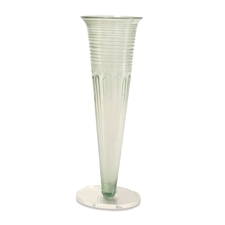 We also have a small piece of glass that has not been formed into a vessel and is possible waste from glass manufacture, although the date is uncertain. Cone beaker, Anglo-Saxon, 5th-6th century AD, From Grave 32A, Kempston, Bedfordshire, England. This beaker has been placed on a stand for display (C) Trustees of the British Museum. The glass that is from vessels is all fragmentary, but they comprise pieces from some very fine Anglo-Saxon vessels indeed. The fragment in the top left of the above photgraph has come from a vessel just like the one in this photo of a cone beaker held in the British Museum’s collections. The large timber hall first discovered last season has not been neglected either! 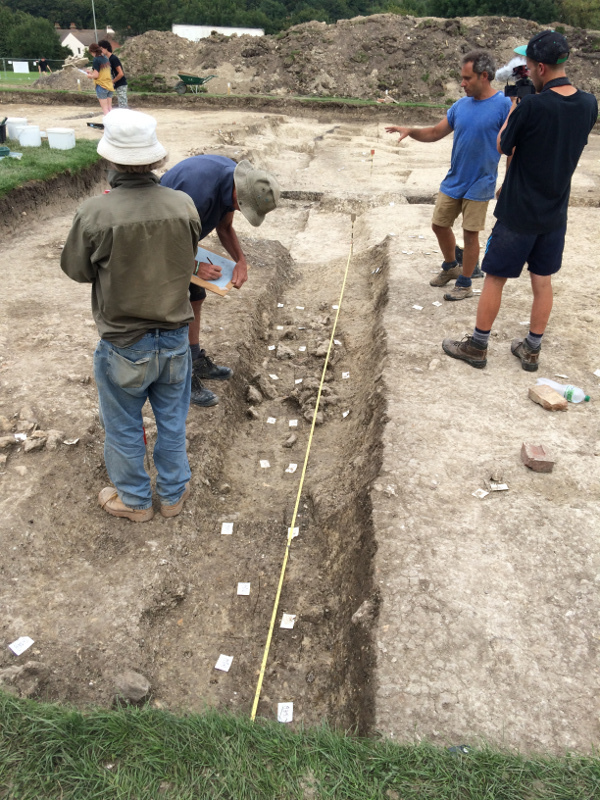 We have made quite an advancement here with the discovery that there are two phases of building associated with the hall that helps to explain the sequence discovered last year and shows how hard it is to interpret complex archaeology in a narrow evaluation trench. The photo above shows the continuation of the wall trench we discovered last year, with the ‘ghosts’ of rotten or removed planks clearly visible in the backfill of the wall (marked by labels). It seems now that it was rebuilt at a later date, using large round post holes at intervals. One of these posts is visible as a black ‘splodge’ just below Peter’s hat as he bends over to draw a plan of the wall trench. This is a very exciting discovery as it helps us to understand which buildings might have been the most important, or at least important enough to merit rebuilding at least once. I will finish this blog post with the very small part we have played in the memorials of the beginning of the First World War this week. Our 20th century discoveries on Tayne Field have included Second World War temporary structures for soldiers posted in Lyminge, and artefacts associated with that short but dramatic period of Lyminge’s history. Although this week commemorated a different, earlier war, it was a war that shaped the last 100 years and influenced what happened across Europe and at home in quiet English villages such as Lyminge, including the outbreak of the Second World War. 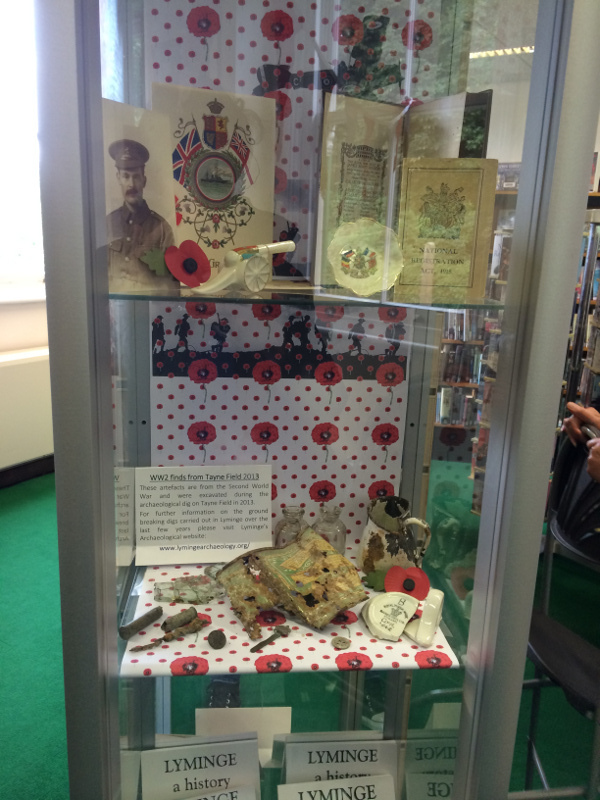 In the library, the Lyminge Historical Society have put together a small display of items gathered from local people from the First World War, and artefacts that we have excavated on Tayne Field from the Second World War. 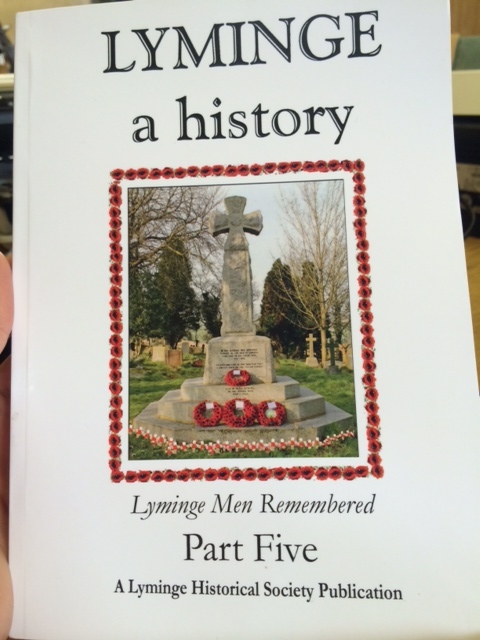 I was invited on Monday to the Lyminge Family History Group’s launch of their book on the Lyminge men who fought in the First World War, published by the Lyminge Historical Society. 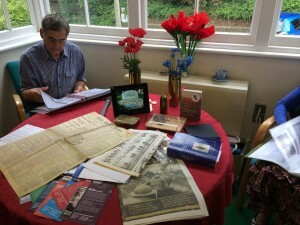 Extracts and poems were read, and reminicences of those whose parents fought in the First World War were heard. It was an opportunity to examine personal histories that I don’t often get working on such a distant past as that of the Anglo-Saxons and the Bronze Age. A candlelight vigil was held in the parish church on Monday evening and many of our staff and students attended, being away from home and unable to attend their own local services. 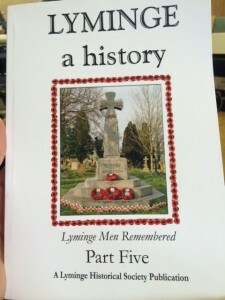 As archaeologists, the commemorations bring home to us that the story of Lyminge begins with the very first people flint knapping on the edge of the Nailbourne and continues right through to the present day where our presence at the book launch was individually recorded to form part of the historical archive. Our excavations try to people the past through objects, buildings and burials, just as we try to people the more recent past with reminisences, photographs and stories before it slips away from living memory. 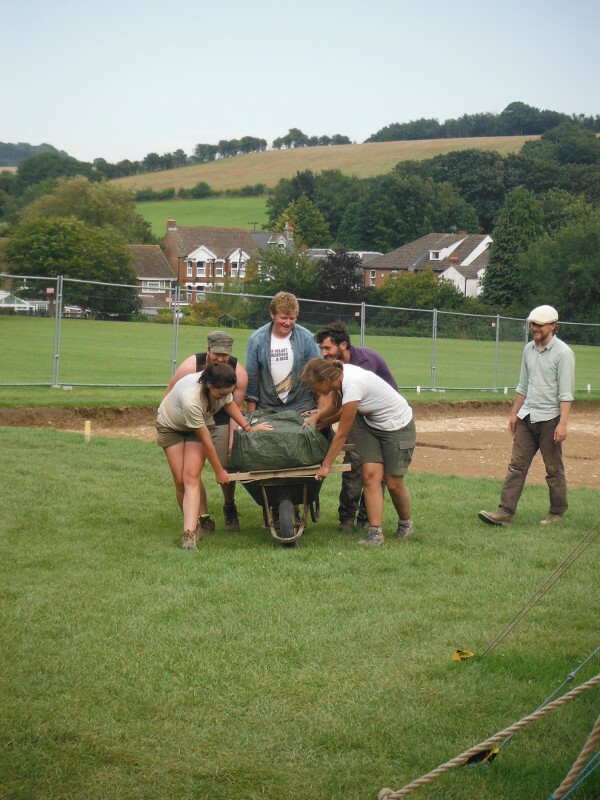 All this is so exciting, the pre-Bronze Age burial is fascinating and we’re looking forward to seeing the dig again at the end of August! Your 3 paragraphs about the WWI commemorations are very apt and moving.